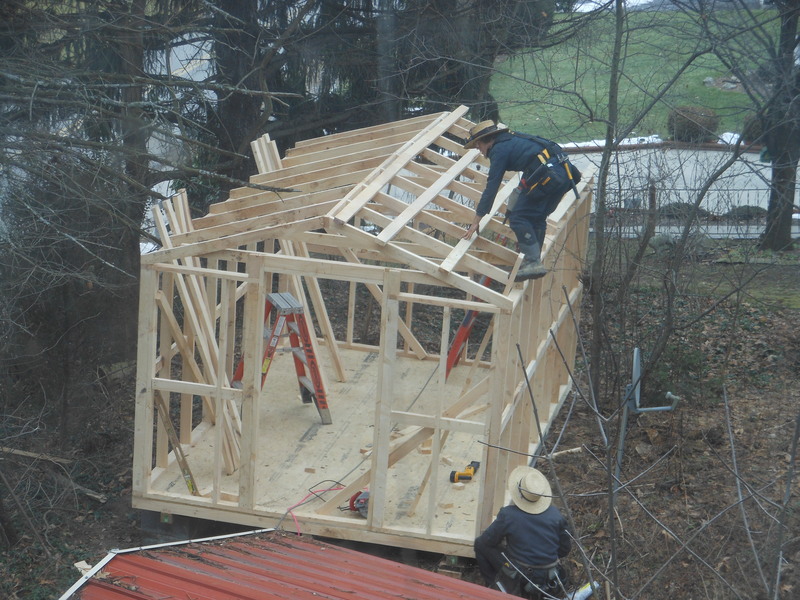 And yes, that does mean that my friends, the Amish Builders are indeed back at my house again today … this time building a Storage Shed on the property. For just a little more than the insurance company had allocated for the replacement on my old brick outbuilding … which was roughly two-thirds the size of this ten by fifteen foot one. Unlike his brother Jacob the Roof Replacer, Reuben the Shed Builder arrived after the sun came up … although not by much. 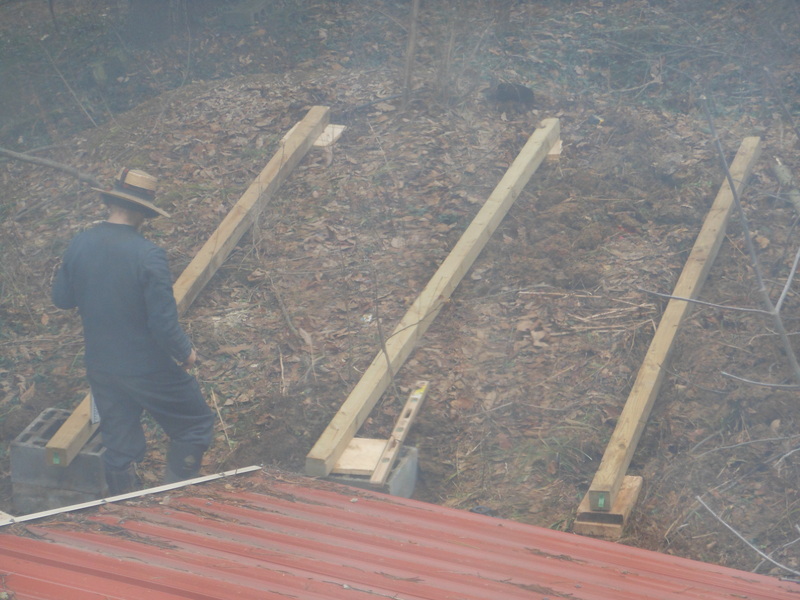 The initial thrill of Amish on my property has waned a bit, so I did not jump out of bed immediately to greet them. Until the buzzsaw started a few minutes later. I’m pretty sure most of my neighbors don’t know my last name, so there were no phone calls about it all. 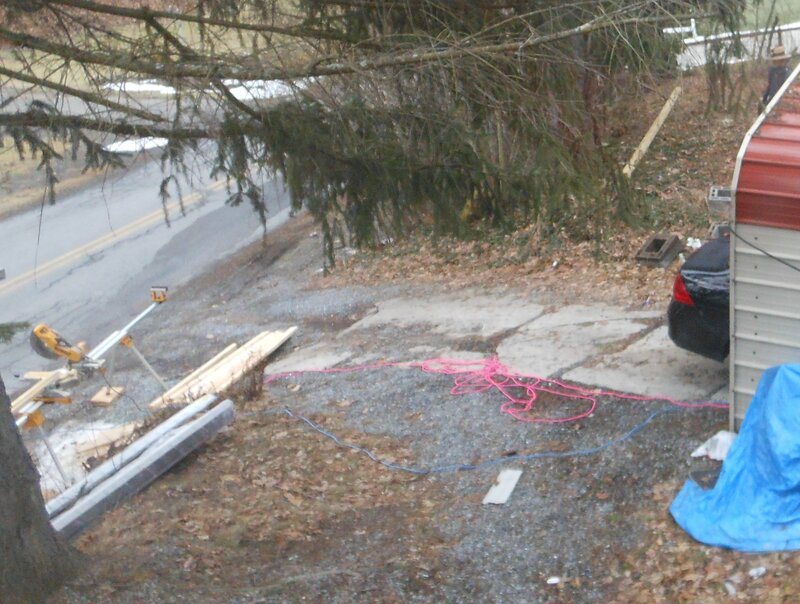 And their twenty-foot Neon Pink Extension Cord right in the middle of the driveway. Alongside their twenty-foot Neon Blue Extension Cord. Both were plugged, in tandem, into my exceedingly boring black thirty-foot extension cord coming from the house. “We decided top help ourselves to the power,” said Reuben. “Um. Right. That’s fine. Help yourself.” I said … still stunned by the Neon Pink. Must have been on sale. Now help me out here. Aren’t they non-electricity users by nature? But between my electricity and the gas-powered generator from the other week, I see that they are not totally opposed to some of the modern conveniences of building products. This helped ease my conscience as I clandestinely snapped pictures of them in mid-work during the day. Their souls were already compromised, I figured. What’s a measly picture or two, right? In no time at all, they had laid the struts for the flooring and put in place the floor material. Not to mention the framing for the side walls and door. Go Amish Go! Go Amish Go! Isn’t there a Football Team or something I could root for … the Fighting Amish maybe? Or maybe I’m thinking of a Chocolate Jesus … Handmade Chocolate, of course. Oh … Wait. The Fighting Amish … talk about an unfortunate choice of nicknames. And of course they would play the Penn Quakers. Who else? And there would be a big Quaker/Amish face-off in the Shaker Bowl … I can see it all now. Lots of horse-drawn Amish Buggies circling the stadium. Brings a whole new meaning to the concept of Tailgating, doesn’t it? 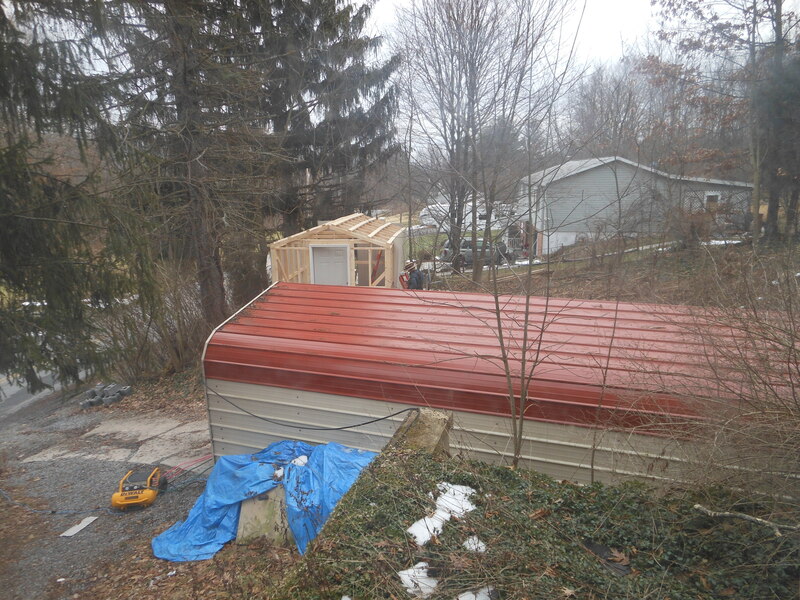 At this point, the Amish have successfully framed the Storage Shed in along with the roof … and installed the door. Unfortunately, I have to leave to go do some actual work outside the home … and as I leave, I notice that Reuben is wearing the traditional strap-on flashlight on his traditional straw Amish Hat. “Will you be finishing today?” I ask. “No, we will work late, but will have to come back sometime to do the finish work and steps.” he answers. I take off down the road, confident that there will be progress when I finally return after dark. 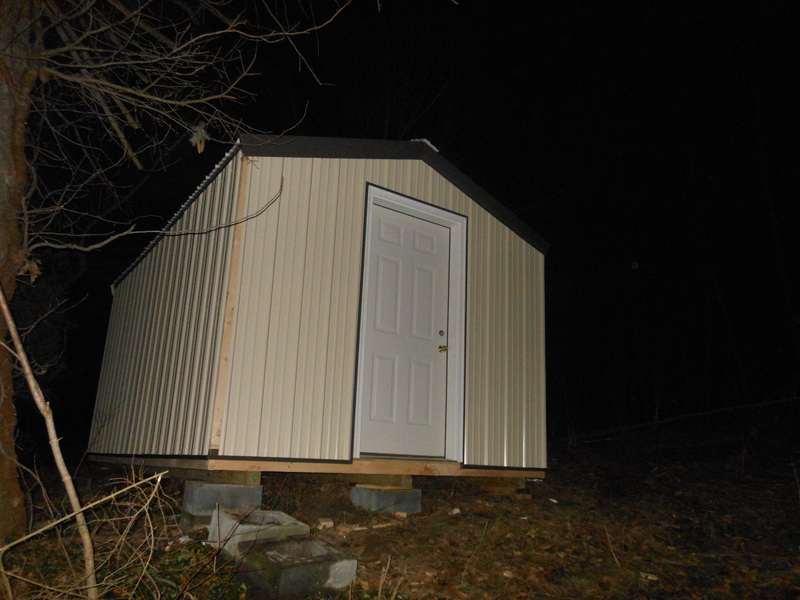 It looks like they have put on the metal siding and the metal roofing. Almost makes me want to use it to sleep in on a warm summer day with the rain beating down on the metal roof. But other items call for it instead.